Cardinal Richelieu devoted himself to securing French leadership in Europe and increasing King Louis XIII's (1601–1643) power within France. Armand-Jean du Plessis de Richelieu was born on September 9, 1585, in Paris, fourth of the five children of François du Plessis, the lord of Richelieu, and Suzanne de La Porte. His father was the head of King Henry III's (1551–1589) central administration and also served Henry IV (1553–1610) before dying in 1590 of a fever. His mother was forced to move the family to the home of her mother-in-law. Armand, who throughout his life suffered from different illnesses, returned to Paris to study at the College de Navarre, from which he went on to a military academy. The family planned for his brother Alphonse to become bishop of Luçon, France, but Alphonse decided to become a monk. Because it would help the family, Armand volunteered to take his brother's place, and in 1603 he began studying religion. He went to Rome in 1607 and was named a bishop by the pope. He returned to Paris and obtained his degree in theology (religious studies). In 1608 Richelieu arrived in Luçon and began his duties as bishop. In 1614 he was elected as a representative of religion in the Estates General (the legislature). At the suggestion of Maria de' Medici (1573–1642), who was the head of a council that was ruling on behalf of her young son Louis XIII, Richelieu was chosen to speak at the last session of the Estates. He then went back to Luçon, but a year later returned to Paris and was appointed secretary of state for foreign affairs and war. He held the post for only five months before Louis XIII seized power in April 1617 and dismissed his mother's staff members. In 1618 Richelieu was ordered into exile in the city of Avignon, France. king's council. The resistance of the king and his ministers gradually crumbled; in September 1622 the pope appointed Richelieu a cardinal, and in April 1624 the king called Richelieu to his council. Richelieu remained the king's principal minister until his death, and he was made a duke in 1631. He gradually built up in the council a group of men, his "creatures," who were loyal to him as well as to the king. These men kept him informed of possible threats against the king, giving him time to foil any takeover attempts. He also relied on his family, which he extended by carefully arranging marriages of his nieces and cousins into great families. He made it clear that he was loyal to the king. Many Catholics, including the queen mother, regarded Huguenots (French Protestants, who opposed many decisions made by the pope and placed less emphasis on ceremonies than Catholics did) as the enemy and insisted that they be dealt with. Richelieu agreed with them up to a point, taking over the Huguenot city of La Rochelle, France, and cooperating on a program of reforms. But he allowed the Huguenots to continue practicing their religion as long as they stayed loyal to the king, and his advice to Louis XIII on other matters caused the queen mother to finally break with Richelieu in 1630. The king then removed her people from his court. Richelieu wanted France to become the leading power in Europe. He knew that the country would eventually have to go to war with Spain, which at the time was a part of the Hapsburg empire (an empire that was made up of parts of the present-day countries of Austria, the Czech Republic, Hungary, Croatia, and others). While he reorganized the French army and established a navy, Richelieu encouraged German resistance to the Hapsburg emperor in Vienna, figuring this would buy the French some time while the Hapsburg king in Spain focused his attention on controlling Germany. He also gave money to the Dutch Republic and the Swedish warrior king Gustavus Adolphus (Gustavus II; 1594–1632) to help them in their fight against the Hapsburgs. Eventually France was drawn into war, which was still going on when Richelieu died on December 4, 1642, having served his country to the best of his ability. Bergin, Joseph. The Rise of Richelieu. New Haven, CT: Yale University Press, 1991. Glossop, Pat. 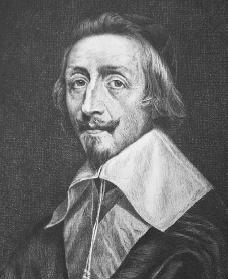 Cardinal Richelieu. New York: Chelsea House, 1990. Knecht, Robert. Richelieu. New York: Longman, 1991. Reprint, 2000. Levi, Anthony. Cardinal Richelieu and the Making of France. New York: Carroll & Graf, 2000.